FileHippo Blogger Template is a premium blogger template inspired from FileHippo website. It is adapted from WordPress theme. 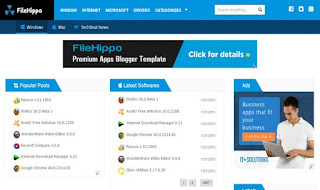 FileHippo is a mega collection Apps blogspot theme specially designed for all mega application blogspot sites. It is fully dynamic theme that work on drag and drop. It has powerful admin panel where you can control the homepage of the site. The template has not only attractive design but it has all the latest Schema SEO tags integration. It uses Html5 and Css3 versions. This template would showcase your mega apps with large audience. So, if you are looking for similar filehippo like blogger template, then This template would be the perfect choice for your next site.